Marvel Comics character of the same name. All of them came out in a single six-month period, October, 1942 through April, 1943. "Hoppy the Marvel Bunny" (as the series was officially titled) first appeared in Fawcett's Funny Animals #1, dated December, 1942. Also starting in that issue were Billy the Kid (an anthropomorphic goat in a western setting), Willie the Worm (who had relatively normal-looking arms but only one very thick leg) and other characters, equally memorable. Fawcett Publications' biggest star, Captain Marvel, appeared on the cover to introduce the menage. Starting with the second issue, and continuing for the remainder of the title's long run, Hoppy was the main cover feature. Marvel Bunny was simply an extension of the Captain Marvel franchise (which included a boy, a girl and a group) into the funny animal world. He wore a duplicate of the Captain Marvel costume, and used the same magic word, "Shazam!" to change from meek, mild-mannered Hoppy to big, strong Captain Marvel Bunny. The character was created by cartoonist Chad Grothkopf, whose work appears in a surprising variety of comic books from the 1930s and '40s. Fawcett's Funny Animals was published continuously until Fawcett left the comic book business, in 1953. Along with Six Gun Heroes, Strange Suspense Stories and many of the publisher's other titles, it was sold to Charlton Comics, where it continued under the title Funny Animals. Charlton's first isue was #84 (April, 1954). Since Captain Marvel was no longer being published, Charlton changed Hoppy's superhero name to Magic Bunny. He was just one of many funny animal superheroes from Charlton — Atomic Bunny, Atom the Cat, Atomic Mouse, and others — but Charlton didn't keep him in print for long. Funny Animals ended with its 91st issue (February, 1956). Today, DC Comics, which purchased many characters from both Charlton and Fawcett, seems to own Hoppy the Magic Captain Marvel Bunny, or whatever his name is, tho his provenance is unclear. They couldn't have gotten him from Fawcett, which passed him on to Charlton decades before selling any characters to DC; and by the time they bought anything from Charlton, they'd already (in DC Comics Presents #34, June, 1981) guest-starred him with Superman, as a denizen of an extra-dimensional alternate world. Whatever the case may be, he's been spotted at least three or four times in the last couple of decades, so nobody seems to be contesting DC's claim to him — which isn't really surprising, since both Fawcett and Charlton are now defunct. He was most recently seen in a 1997 issue of Power of Shazam, which starred the human Captain Marvel. 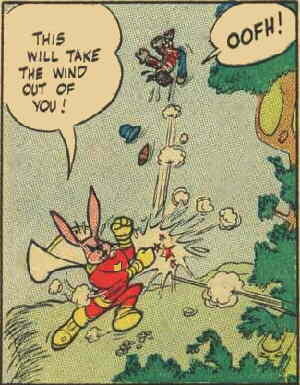 But like DC's other funny animal superheroes, which include The Terrific Whatzit, Captain Carrot & His Amazing Zoo Crew and Henry Boltinoff's Super Turtle, he spends most of his time as a denizen of comic book limbo. Text ©2001-10 Donald D. Markstein. Art © Fawcett Publications.